/ The Real ID – A National ID or Mark of the Beast? The Real ID – A National ID or Mark of the Beast? Since early 2006, Irvin Baxter has been raising awareness of the Real ID Act which requires all U.S. citizens to receive a Real ID card by May, 2008. He speculates that it could lead to the Mark of the Beast in America. Could it, and should we refuse it? Drive your car, board a plane, train, or bus, enter any federal building, open a bank account, or hold a job. If you can’t hold a job or have a bank account, how much buying and selling will you be able to do? Further he points out that the states are required to link their databases or lose federal funding, making it more appropriate to call it a National ID card. There is a prophecy in the Bible that foretells a time when every person will be required to have a mark or a number, without which he or she will not be able to participate in the economy. The prophecy is 2,000 years old, but it has been impossible for it to come to pass until now. With the invention of the computer and the Internet, this prophecy of buying and selling, using a number, can now be implemented at any time. Has the time for the fulfillment of this prophecy arrived? Irvin fears that the Real ID act can possibly be the mechanism that turns into the Mark of the Beast for America, or "the legislation that will be used to enforce the Mark of the Beast in America if we do not get it reversed." Although he only asks people to pledge they will not vote for politicians who are not for the repeal of Real ID, he raises the question about whether he himself will feel comfortable with receiving card without which "you cannot buy or sell" in America, hinting that it could be dangerously close to the mark of the beast. He hopes somehow the Real ID Act can be repealed and thereby possibly make America one of the few nations that fight and reject the Antichrist's Mark of the Beast. He even says, "it's up to you to stop the Mark of the Beast" or refers to Real ID as the "Mark of the Beast Act." Is this new U.S. Real ID Card a "real" issue we should concern ourselves with, especially considering that other countries have had national ID cards for years with none yet turning into the mark of the beast? What does the Bible really say about the Mark of the Beast and America's role in the End Times? First, the Mark of the Beast does not even appear on the scene until after Mystery Babylon the Great falls. Revelation 14 gives us this sequence of events explicitly through the messages of the three angels (more on this in my book Planet X in Bible Prophecy). In other words, the United States will be destroyed in World War III before the mark is rolled out. Second, the Mark of the Beast is not something that we are told we should fight anyway (as if we could prevent written prophecy from happening). Instead, Bible prophecy tells us to flee Babylon and move to a specific location where God will gather his people, just like he did before with the Exodus (which he called bearing them on eagle's wings, just like Revelation 12 describes this Great Tribulation Exodus to safety for 3½ years). 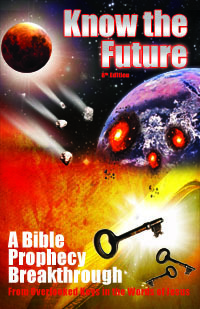 My books Planet X in Bible Prophecy and Mystery of Disunity both talk in detail about the real pre-trib plan of God to save his people. I think it is great that Irvin raises people's awareness on how Americans are losing their freedom as well as how our politicians lie to us about it. My eyes were opened and I woke up in the 1990s to the true nature of our "christian nation" and its government thanks to listening to people like Irvin Baxter. To realize all in the world is not as it seems (or as we hoped) is an important milestone along the way towards learning to discern and think critically. However, to associate the Real ID as possibly America's Mark of the Beast is a mistaken and potentially harmful teaching. I hope people do not fear the Real ID so much from EndTime's campaign against it that they feel compelled to refuse it out of fear and then suffer needless trouble in their lives for doing so, or loss of time fighting "city hall." It is not and will not be the Mark of the Beast. In no way is it forbidden in the Bible to have one. It is simply part of a constantly higher loss-of-privacy price for living in the best country with the highest standard of living possible in support of your family. To refuse this or outright fight it could make a disaster of your life. I've seen this before with Americans who learn about their constitutional sovereignty and how the government has encroached on it. They try to exercise their sovereignty by, for example, not paying income tax when they learn it is unconstitutional. The government may be wrong and you may even win in court once, but they will take their pound of flesh. In the case of income tax objectors, they seem to always lose in the end, even if they have one of the rare court victories such as Vernice Kuglin who later in civil courts with the IRS lost nearly all her wages towards back taxes. And if you somehow stay one step ahead of them, you will be spending all your time and energy to do so with little time left to fulfill God's work. Perhaps for this reason the example was recorded of what Jesus choose to do when confronted with the Roman Temple tax. He chose to pay it rather than fight a government regulation he pointed out as unfair for him to pay. He cited the reason that it was wiser not to "provoke them" into making trouble with us over this relatively minor issue compared to his true message (Matthew 17:24-27). His message was clearly not one of fighting for our sovereignty under pagan rule. Therefore, my advice is to get yourself a Real ID if required and use the time and money you save in having one to seek God in fasting, prayer and study more diligently every day. Do not misunderstand, my position is in no way in support of the Real ID Act (identifying people is historically a prerequisite to enslaving them). We simply must choose our battles carefully and not divert ourselves from our true calling and commission to "bear much fruit" (John 15:8) and "take care of our own" (1 Timothy 5:8) into a futile fight God never called us to. A good half of the battle in our walk with God is simply to prevent distractions like this from diverting us from what the Bible tells us to do. P M, the real ID has nothing to do with the mark of the beast because the Antichrist is not here yet and he’s not limited to America! There has to come the 6th Trumpet war first also the Temple has to be built and the Mark of the Beast is not on a card it is in the hand the right hand under the skin or on the skin and cant be removed after you receive it. If you take it your next step will be into HELL because there is no forgiveness on this decision and that will be your decision to make. Dale, the 6th trumpet comes after the 5th trumpet which is the start of the Great Tribulation and mark of the beast.